There are QuiBids employees … and then there’s Fulfillment Director Ward Wulf. Ward helped build the fulfillment process that we now execute every single day, to make sure you get your the great products that you win in our auctions! He’s an integral part of the team at the head of his department, but that doesn’t also mean he’s above jamming out some pop tunes on a Friday turntable.fm session. Take a minute to get to know one of our Above and Beyond Managers! 1. 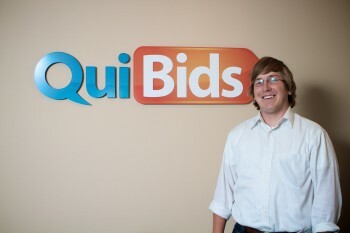 When did you start working for QuiBids? 2. Dang. What’s the biggest difference between the early days of QuiBids and now, for you? 3. Please describe what it’s like sharing an office with Thomas “Mr. Tumnus” Fleming. Tough one to describe, I’ll have to turn to pictures. 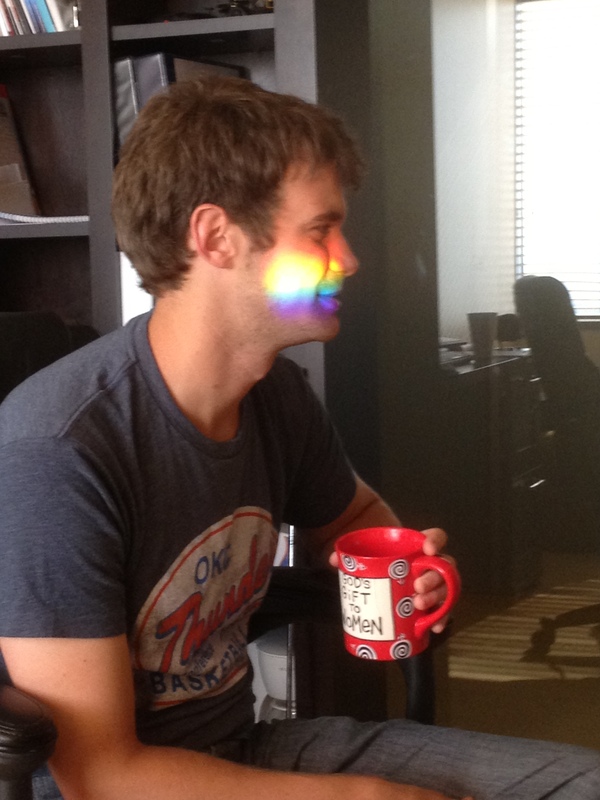 Snuck in this shot during a meeting last week – God seems to approve of the “God’s gift to women” mug given to him by his mother. He’s one of a kind, and I’m lucky to have him working in the fulfillment department. I wouldn’t have been able to win an award like this without him and the rest of the team working so hard. 4. If QuiBids were an episode of The Office, which character would you be, and why? 5. What’s your favorite thing to do outside the office? Easy one – fly fishing. Probably not what you’d expect as a go-to hobby for a flatlander, but I can’t get enough and I’m lucky enough to have a really understanding wife and a posse of QuiBids fly fishers. 6. What’s your favorite movie starring Bill Murray? Some would default to Carl Spackler from Caddyshack or even Phil Connors from Groundhog Day, but me? I’m Bob Wiley from “What about Bob?” He carries his pet goldfish around in a mason jar tied to his neck and wears his “Don’t Hassle Me, I’m Local T-Shirt.” I like to take life in baby steps. Bob Wiley understands this. We both love being out on the water, like when Bob ties himself to the mast of a sail boat to learn to become a true sailor. I probably shouldn’t admit it and ruin my rep… but doodlekisses.com. 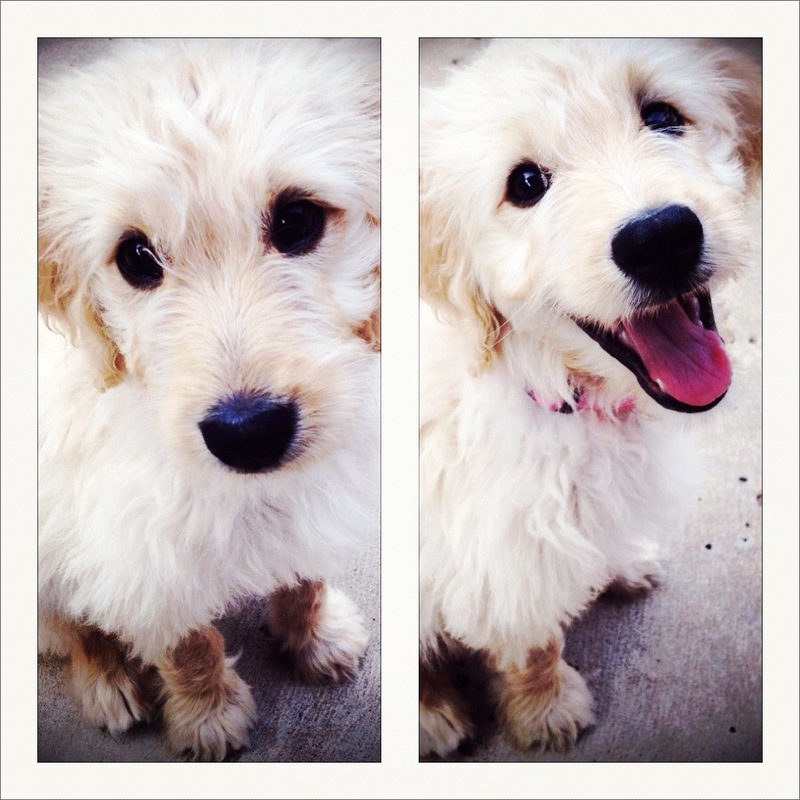 We just brought home a golden doodle puppy named Willow and she’s a handful – trying to learn a thing or two about being a good dog owner. 8. Fill in the blank. The most important quality I look for in the employees I manage is _________. 9. Kanye West / Taylor Swift. Whose side are you on? Kanye West thinks he’s the voice of this generation, but really he just creates some pretty hot jams. I’m going to go with Taylor Swift on this one. There are two types of people in this world: Taylor Swift fans…and liars. Even the most macho of bros cruise around blaring “You Belong With Me.” If you don’t, you fall under the “Liars” category. 10. What’s the best part about working for QuiBids? Working for QuiBids has to be almost as exciting as participating in QuiBids auctions – the work itself is fun and challenging and I’m very lucky to be working with great friends. Read about our previous Above and Beyond Employees!